You can customize Startup sound by a Stream Sound or Path of sound. It’s support Null Icon (An Transparent Icon)! 1- CloseBox: Disable or Enable Close Button. 2- StartupActivation (In Normal Forms it’s ReadOnly): Disable or Enable Active Form when it showing. 3- RealClosing:Replace Formclosing Event with this Event (It ocurrs when End Animation finish.). 4- RealIcon: Replace Icon property with RealIcon. 5- RealTop: Gets or sets Top of Form after animation finish. 6- RealOpacity: Gets or sets Opacity of Form after Fade Animation finish. 7- BeforeFadeOpacity: Gets or sets Opacity of Form before Fade Animation start. 11- UserName: Gets current user name. 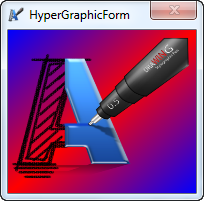 UseHyperGraphic is a MustInherits Class.It add All Customizable Properties of Fix soft HyperGraphic Form to your class! The Form is stored on Protected Overridable Property FrmHyperGraphic. 5- Select "Fix soft HyperGraphic.DLL"
1- Go to Desinger Code.